So I have currently used basic html and css coding to create a website for a client. The template uploads to the extension manager but when I go to preview it, the page looks nothing like it's supposed to. None of the styles from my css stylesheet are showing up. I'm new to Joomla so some help for this newbie would be greatly appreciated. If you need any more information I will be glad to give it. Unfortunately I am unable to provide a link since the site isn't live yet but will give you guys links to some screen shots. Joomla works a little differently when importing CSS and JS files. Also, to help you identify why your original CSS wasn't being loaded, I can see you're already making use of your browser's "developer tools" (the Chrome term) or even better the Firebug add-on for FireFox - it'll help you see the full URIs used for every page "component", along with a vast amount of other essential information about your generated pages. 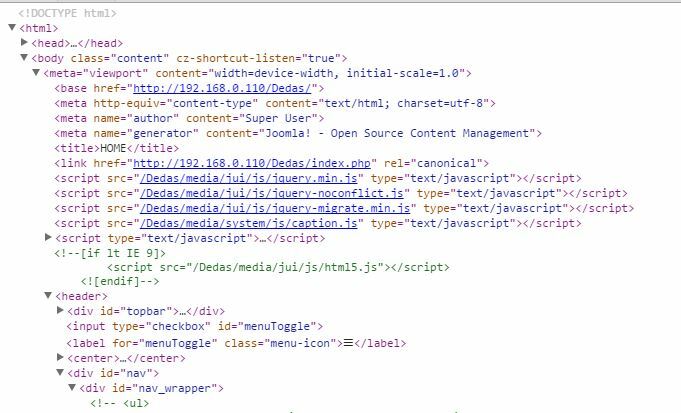 From your screen shot of the developer's tools, your page generation has gone seriously awry as the HTML meta, script and other elements are all in the html body element - in your screenshot, you haven't expanded the generated head element so I can't see what's in there. Remember that with the developer's tools you're not actually looking at the page's source, you're looking at the browser's/tool's parsed and interpreted version of it (so you may wish to look at both). However, the exact content of those might require some further research on your part. Make sure your not missing <jdoc:include type="head" /> inside head tag. Not the answer you're looking for? Browse other questions tagged templates css or ask your own question. How to add custom JS/CSS file, without modifying the template (from extension)? Use custom CSS for only part of a Joomla page?